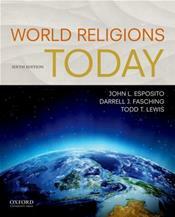 Revealing the significance of religion in contemporary life, World Religions Today, Sixth Edition, explores major religious traditions--Judaism, Christianity, Islam, Hinduism, Buddhism, South Asian religions, East Asian religions, indigenous religions, and new religions--as dynamic, ongoing forces in the lives of individuals and in the collective experience of modern societies. This unique volume accomplishes two goals: it connects today's religions to their classical beliefs and practices and focuses on how these religions have both radically changed the modern world and been changed by it. The book is enhanced by numerous pedagogical aids--text boxes, timelines, maps, illustrations, discussion questions, a comprehensive glossary of key terms, and suggestions for further reading--and more than 200 photographs.